Users will discover ways to ... Work faster. Select, make, and grind cutters. Surface grind blocks, pins and shapes. Cut threads, knurl parts and eliminate warp. Choose realistic feeds, speeds and depths of cut. Remove broken taps, drill bits and other hardware. Apply proven CNC techniques to maximize output. Improve surface finishes and hold tighter tolerances. Assist engineers with design and manufacturing issues. Improve indicating skills and develop a “feel” for machining. Now includes 4-color photos throughout. Features a reformatted layout which fully integrates the text and photos to make the book more accessible. Chapter 15, "The Incredible CNC," has been greated expanded and completely updated to reflect advances since the previous edition. Most chapters now have easy-to-use tables summarizing all of the tips, suggestions, and secrets from that chapter; enabling readers to see in a glance the detailed topics covered. James Harvey is a full-time machinist and plastic mold maker. He has made his living working in shops across the U.S. for nearly 40 years. 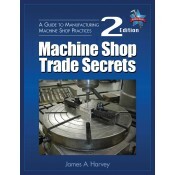 His no-nonsense approach to listing machining rules-of-thumb is an unprecedented, effective way to share this valuable knowledge.